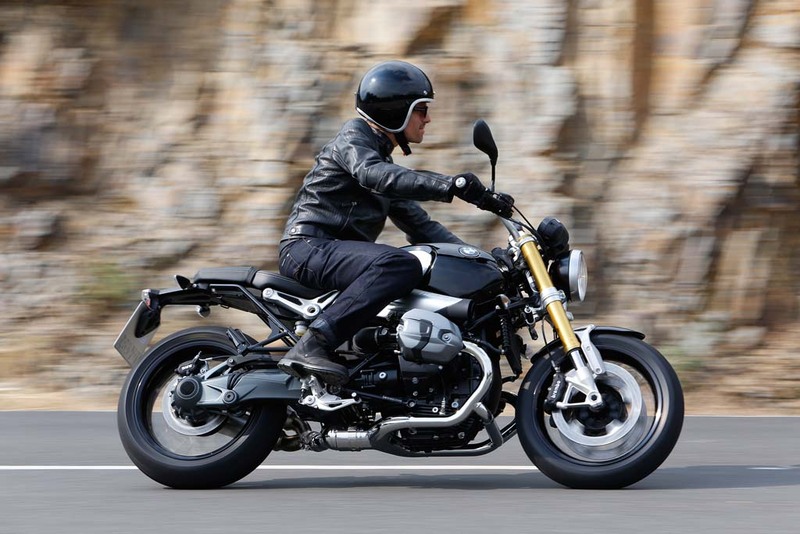 UPDATE: BMW announced U.S. pricing for the R nineT at $14,900. 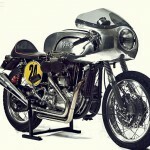 BMW revealed a new modular-designed boxer-powered café racer commemorating the company’s 90-year history of producing motorcycles. 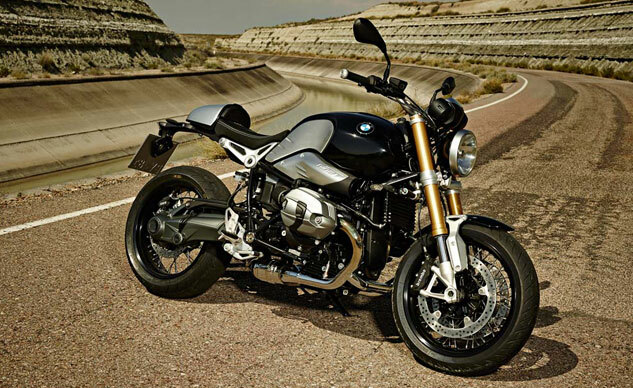 The production embodiment of the Lo Rider concept, the 2014 BMW R nineT offers a classic roadster look and a high degree of factory customization. 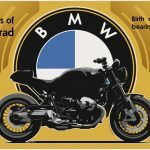 Motorcycle.com‘s newest addition, Evans Brasfield is in Munich right now for the official unveiling of the nineT. He’ll have more details soon, but for now, here’s what we’ve learned. 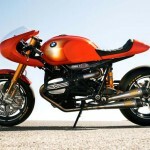 When the Lo Rider concept was introduced in 2008, BMW said it would offer a number of customization options, allowing customers to create their own individualized model. 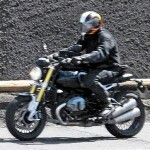 That idea has transferred over to the production nineT, with a number of modifications available from different exhaust systems, LED indicators, tail covers, or even the choice of no tail at all. Holding it all together is a modular tubular steel spaceframe consisting of a front frame section with integrated steering head and a rear section which connects to the swingarm. The pillion subframe provides support for a passenger or a tail-mounted softbag, or it can be removed completely to have just the single seat. Acting as a load-bearing element of the chassis is a 1170 air-cooled boxer twin that BMW claims offers 108 hp at 7750 rpm and 81.1 ft-lb. at 6000 rpm. The exhaust system flows out to the left side, ending with stacked twin silencers, but as we saw in recently published spy photos, BMW will offer a number of factory-installed options including titanium Akrapović exhausts with carbon heat shields. If there’s one area BMW has strayed away from tradition, it’s in equipping the nineT with an upside-down telescopic fork instead of the company’s signature telelever suspension. The fork is actually the same as the one used on the S1000RR, which means it offers compression and rebound adjustments. At the rear, the single-sided swingarm is suspended by BMW’s paralever system with adjustable spring preload and rebound damping. The stainless steel wire-spoke wheels have black anodized alloy rims and black aluminum hubs. The wheels come standard with a 120/70 ZR 17 tire up front and a 180/55 ZR 17 tire at the rear. Stopping the wheels are four-piston monobloc calipers controlled with steel-braided brake lines, gripping twin 320mm discs at the front. At the rear, a two-piston caliper grips a 265mm disc. 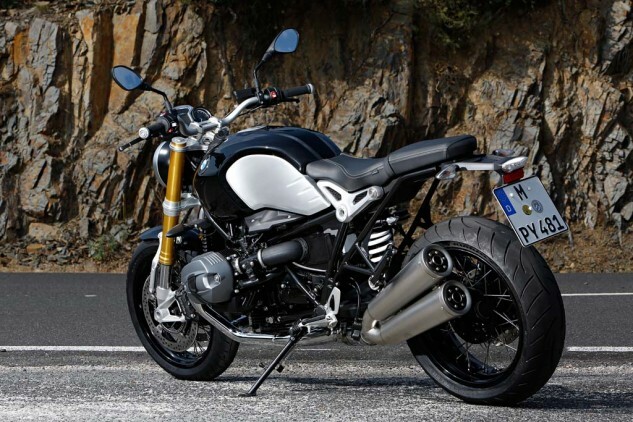 As per BMW policy, the nineT will come with ABS as standard equipment. 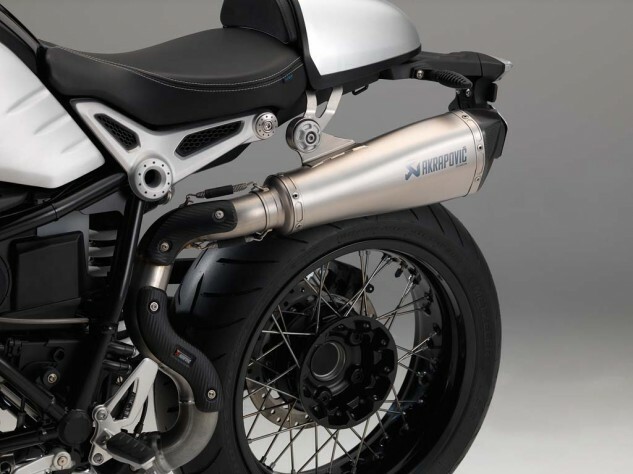 The 4.8-gallon brushed aluminum fuel tank with embossed nineT logos, and can be customized with rubber kneepads. The air intake cover is also a naturally anodized brushed aluminum. Other features include a 30.9-inch seat height, and a circular headlight with the BMW emblem in the center of the bulb cover. The steering yoke and handlebar clamp brackets are made of forged aluminum, glass bead-blasted and given a natural anodized finish. 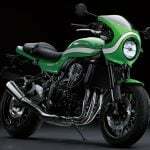 The instrument cluster consists of two classic round speedometer and tachometer gauges and a modern digital display showing engaged gear, time, range, fuel consumption, average speed, trip mileage and servicing interval. Stay tuned for U.S. pricing details.